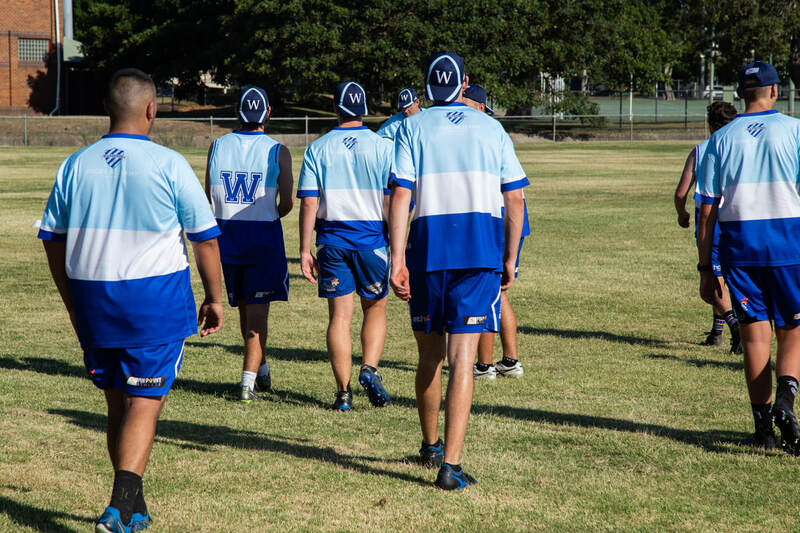 Heading up the Wanderers Rugby Academy in 2018/2019 was Under 18’s coach and senior strapper, Shane Goldthorpe. Several specialist coaches were brought in to assist, making this one of the best programs we have offered and a footprint we will continue to use going forward. Dan Bunyan who specialises in speed & agility as well as strength & conditioning put the players through their paces every week adding in programs to follow up on at home and throughout the coming season. We saw great improvements in all players who completed the program from the start to the finish as technique improved. Dan will also be working with our Under 13s - 15s during the pre-season to assist them with technique and athletic development. Scott Dalibozek who is co-coaching our 18s this season, featured regularly throughout the Academy. Dipper’s focus was on getting the basics right and he is the master of skills and drills. Our junior coaches took advantage of this and attended sessions to learn new drills. Stuart Pinkerton was a favourite amongst the attendees, he says it as it is and he had the forwards working hard during all of the sessions he ran. It was great to welcome him back to his Club and the boys relished the opportunity to work with him. Off field player development is an important part of the Wanderers Academy. Throughout the program we invited many guests to meet with our participants both formally and informally. Headspace came along to discuss the importance of good mental health and recognising cues; Ethos provided education on nutrition and hydration and discussed the controversial topic of supplements. We welcomed Old Boy Angelo Agresti to discuss the history of the Club and the importance of the bond and relationships formed through rugby; as well as Wanderers Rugby Community secretary Andy Traill to discuss the significance of the WRC and their contribution to our great Club. Andy also coordinates the Christ Church Cathedral Community Lunches that are held fortnightly at Newcastle Grammar School and discussed this important aspect of the Newcastle community supporting those in need. Part of the commitment to the Academy involves a commitment to assisting with these lunches throughout the school holidays. Giving back to the local community just as the coaches and speakers gave to them throughout the Academy. Congratulations to the young men and women who took advantage of this outstanding program throughout Nov - Jan. It's a tough gig throughout the heat of summer but you will all benefit from having participated in it. Wee Wanderers is a fun, friendly introduction to rugby union for 3-10 year olds. Wee Wanderers is about ensuring all boys and girls get involved, have fun and learn the skills of the game in a safe and positive environment. 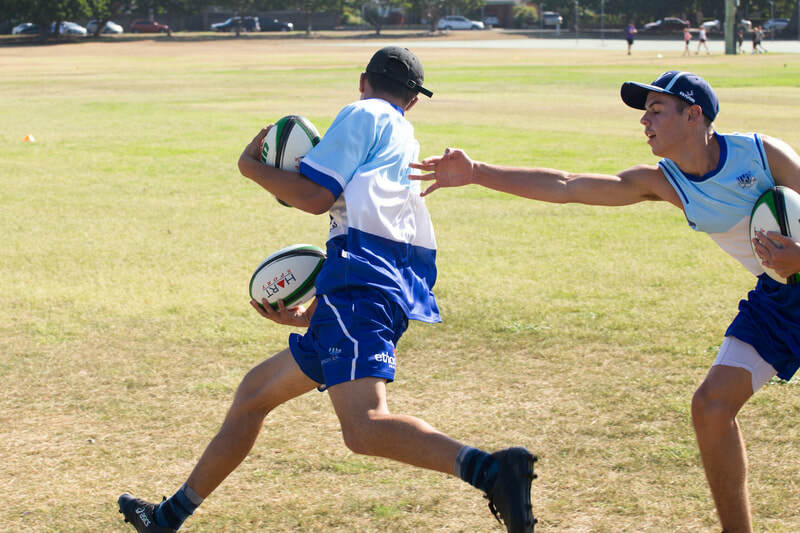 Our specifically designed rugby program teaches children how to pass, catch, tackle and run as well as take turns and work as a team. 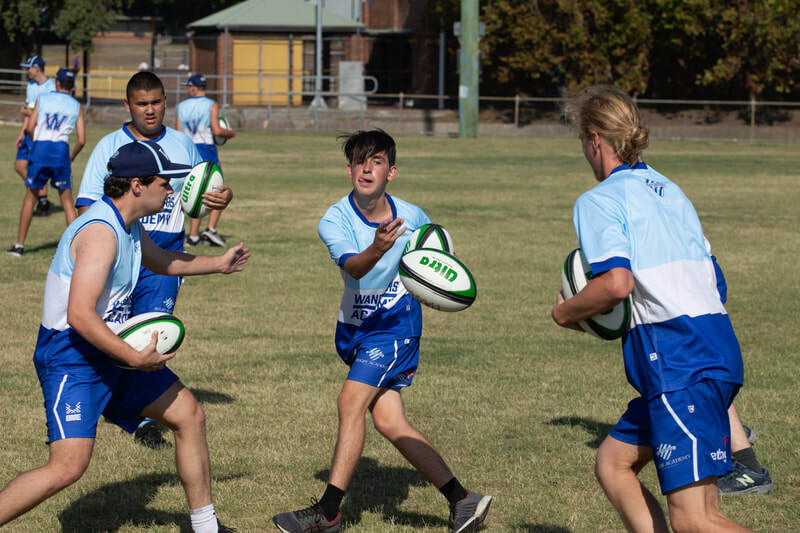 Facilitated by experienced coaches and players in a safe training environment, this program combines basic skills with lots of fun to build a lifelong appreciation of rugby. But more to the point - it's Ladies Day!! The girls on the southern hill looked fabulous. The sun shining all day. The music was great. And the cocktails kept coming. Half way through the season and despite what many pundits were predicting our Club remains in a strong position across all the grades. So how are we going. Lets have a look at our mid year report card! Premier 1 – Clearly an A. We have only dropped one game at the half way mark and that was only in the most controversial circumstances to Hamilton. The coaching staff of Viv Passi and Dan Beckett have done a tremendous job of shaping a new look Wanderers team. Prior to the season kicking off we were questioned as to the quality of our set piece and the loss of so many players from last years Grand Final team. The group has answered these questions in the most emphatic of ways. Mid season we have the best defensive as well as the best points differential in the grade. Still plenty of room for improvement, certainly, but the team is into this competition right up to their eyeballs. In teacher speak our season so far could be summarised as “performing well but with further commitment will realise their potential”. Premier 3 – Probably a B at this stage. The team has been hamstrung in the early stages of the year with a number of personnel changes and an ever changing starting line-up. Such is the world of the P3 grade it is always difficult to shuffle players between the grades with P3 being the vehicle for returning players as well as new players to the game of Rugby and to the club. Even through these issues the ‘brains trust’ as they are referred to, have worked hard to have the team sitting firmly in the top five at the half season mark. Their most recent performance against Hamilton was easily their strongest of the year and we will look forward to a much more consistent second half of the year. The report “with more consistent effort the group is sure to achieve a strong outcome by seasons end’. Colts – A very solid B+. This group of young men, after a reasonably shaky start to their senior Rugby careers are certainly now finding their feet. Getting use to the weekly grind of training and playing, while mixing it in with jobs, school and University have been a delicate balancing act for many of the players. Mid season the team is sitting second and are displaying so much potential it is literally scary what they will produce when it all clicks for them. Coaches Ben Christensen and Blake Walsh are doing a mighty job in not only producing quality young players but also quality young men. Their report card says “with greater application the obvious potential of the team will be reached and we can all look forward to excellent future results”. Our Junior Club continues to go from strength to strength. Great administration at the top combined with well organised and omitted Junior Coaches and Managers see many of our teams sitting in the top three of their respective competitions. We have attempted to provide opportunities for as many junior teams as possible to play their matches on No 2 Sportsground and while we have been very successful in achieving this goal, it is important to realise that we must work in conjunction with the Newcastle Council to ensure that the Ground is kept as the showpiece it currently is. Our Women’s team is also sitting pretty near the top of the table. All in all our Club is very healthy and we continue to work hard in ensuring that the current crop of Wanderers, and as importantly, the next crop of Wanderers, are committed and as prepared as possible to carry the two blues into battle. It would also be remiss of me not to mention the tireless efforts of our General Manager Cal McDonald. Having had the pleasure of working closely with Cal over the last nine months, I can confidently tell the Wanderers faithful that the Club is in very good hands. The energy he displays in every facet of the job, and his willingness to do anything for anybody makes dealing with Cal so easy. His extremely intelligent and innovative ideas, coupled with his great people skills, will see Wanderers grow as an all sports Club and remain a dominant player in the Newcastle sporting landscape. Even though we are only half way through the 2017, season plans are already under way of how we will continue to grow our club next year and for the years following. Shortly a group will get together under the leadership of IRB representative Bruce Cook where we will develop strategies aimed at ensuring Wanderers remain the show piece Club in our area for years to come. At the meeting we will formalise strategies around recruitment, around juniors, around our one club structures as well as everything else that could affect Wanderers Club moving forward. Our loyal supporters and members of the Wanderers community can express their ideas and thoughts on anything Wanderers by contacting Cal McDonald through the contact details on the website. The strategies that come out of this meeting will be the subject of the DOR diary before the end of the season. See you at the game! Bob Harrison, Wanderers Director of Rugby. only loss a close 0-5 result to Carlton. The amount of training they are doing as a squad with the P1 team is showing dividends and by seasons end our depth will be well prepared for the play-offs. Our Thirds have won three from five and are learning to cope with the continual turnover of players. A pleasing aspect for our future is the number of new faces coming to the club and it is through the Thirds that these players become familiar with the Wanderers Way. Once the higher grades sort out their teams our Thirds are sure to have greater solidarity and consistency which will see them climb the table. Our 19’s are also three from five and sit third but anyone who has seen this team play will agree that with some further hard work the boys are more than capable of being there when the whips are cracking. The ‘buy in’ that the players are displaying to our systems is extremely pleasing and this group of young men are beginning to develop an understanding of what being a Wanderer is all about. Our Fifth Senior side are our Womens team and currently are sitting unbeaten on top of the table, including consecutive wins in the last few weeks against Carlton and University, last years grand finalists. Congratulations to Geoff and Anika and the girls who have been working very hard at training to achieve an obvious high level of play. Many of the Girls games are played after First Grade at our home fixtures so I would invite all of our supporters to hang around and watch the girls play. As of the end of Round Five we sit top of the table in First Grade, second in 2nds and third is Thirds and Colts. Most pleasing for us all is our lead in the Club Championship. Our Junior club continues to flourish with teams in all grades from U/7 through to U/17’s. Already this year the Junior arm of our club have run two very successful Friday Night Footy promotions with large crowds being treated to some high quality Junior football. What has made it even better is that Wanderers are undefeated on Friday nights. At this early stage of the year our older junior teams, the U15s, U 16s and U17s are all undefeated. Our Juniors can be seen in action most Saturdays playing at No 5 and inside at No 2. It is so important that we embrace and grow our Junior’s as they are, all importantly, the lifeblood of our club moving forward. Wanderers as one club continues to work hard in ensuring an appropriate development structure for all of our teams. The efforts of an untold number of volunteers often go unnoticed but never goes unappreciated. It disappoints us when we look around and see the game we all love slowly being strangled by lack of support and poor administration. While we all appreciate the difficulty of coordinating upwards of ten or so clubs into an equitable and fair competition, it still frustrates us when we see inconsistency and lack of foresight seeing a stagnant competition. In Premier Rugby we have the situation of one Club not even fielding the required number of teams, yet still they can continue unencumbered in the Premiership. The NHRU does not have to look too far to see how firm decision making leads to a flourishing competition. The Newcastle Rugby League were willing to allow Clubs to fall over to strengthen the competition they were conducting and the eight teams they run have never been stronger. On top of this, believe it or not, the Newcastle Rugby League have over 40 different clubs contesting their second tier competition and have a flourishing Ladies competition running in conjunction with their main competition. Crowds are up and sponsorship for all teams have never been stronger. What are they doing so right that they are in this strong position? What can we learn from what they do? Currently our second division has only a few clubs involved. None of us have the answers however to find the answers we need to ask the questions, and do it quickly before we cant save it. Junior competitions are struggling and the Schools Rugby involvement is on the verge of collapse. At Wanderers we will not sit back and let this happen. Our involvement through our one club structures ensures that we are developing strong links between Junior and Senior arms of our club. Our premier Rugby experience invites a different junior team each home game to gain some exposure as to what life is like at the top. They gain entrance to the dressing room prior to kickoff, get a talk from the Premier 1 coach and attend the team warm-ups. They finish their day by helping out as ballboys. We have also formed a partnership with Merewether High, the Regions only academically selective school. This partnership has already seen benefits for both partners, with the Schools First XV experiencing great on field success while they have also contributed two full teams to our growing Netball Club. At Wanderers we are looking very much to what we want our club to look like in 2020, and making sure we are strong and successful then very much is determined by what we all do now. Match Day #1 saw us meet with mixed success against arch rivals Merewether Carlton. Though we didn’t win all grades on the day, each and every team showed great fight and at no stage did anyone give up. This is only the first week of the competition and I can promise that over the next few months supporters will see significant improvement from all our teams as new combinations get together and we start to get players back that are either overseas or coming to the club arrive and become 2017 Two Blues players. The Colts started their season with a decent performance however the result at the end didn’t go our way. The coaching staff have worked hard in melding last years U17 Premiership players with those more experienced colts that played in last years Colts Grand Final. This will take time as the team learns new ways to play the game and the structures that have made our Club one of the most successful in the Zone. An important aspect for our U19’s is dedication to training and ensuring that their preparation is on point. It is disappointing to see that the growth of the U19 competition has not reached the heights hoped for by the NHRU. The majority of Premier Clubs are not represented in this competition which of course is of concern when you consider the importance of promoting juniors and young players into the senior grades. We are already looking towards our U19 squad for the 2018 and have started to put in place arrangements that will assure us of this pathway for players in the future. 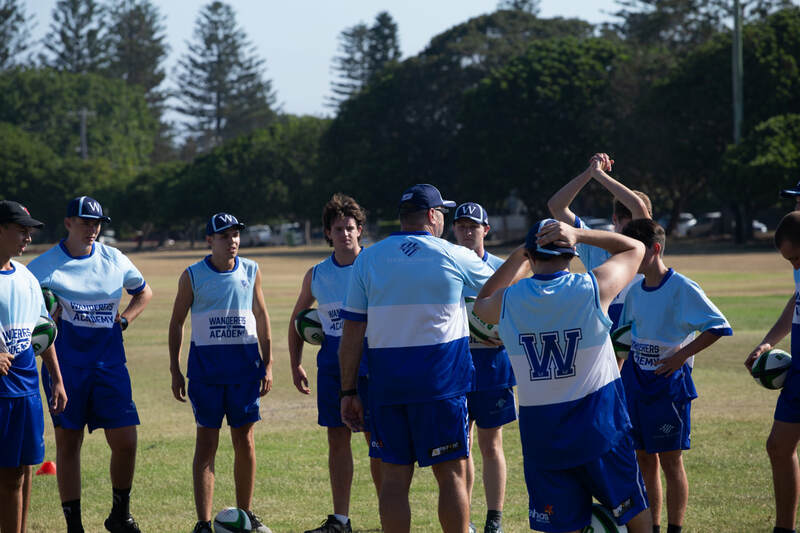 Our Premier 3 Grade suffered greatly due to the number of new players that turned out for the Two Blues and the need for these players to develop both combinations and fitness. To have to face up to a very strong Greens team was a huge task and so it turned out with us suffering a 7-50 loss. This team is sure to improve quickly as team training is conducted that focus the players on structures and team play. The real surprise of the day was the great performance of our Premier 2 team. The Greens team in this grade has been the pace-setters for some time and were outstanding in 2016 as they cruised to the Premiership. A very much new look team faced up to the awesome task of matching it with the Greens and not only did they succeed in their task but were probably the better team on the day. A close 0-5 loss was a heartbreaker for the new look team but they all took a great deal of positives out of the close loss and the lessons learnt are sure to hold the side in good stead for the remainder of the season. Look out for good things from these guys throughout the year. Our Premier 1 team faced up to the Greens challenge with 5 debutants in the starting lineup. It has been a number of years since we have started so many new players in the first round of the competition and although those close to the team were confident that we could get the job done there didn’t seem to be too many others out there who shared the same view. Although far from perfect the Two Blues were still too good for the Greens and recorded a strong 19-10 victory, scoring two tries to one. Both sides were very rusty in aspects of their execution however we were deserved winners and probably should have won by a few more. Securing the win was the main goal as Merewether are one of the top teams in the competition and any victory against them is going to be very hard earned. There were a number of strong performers on the day, not least of all our two props Leeland Marshal and Simon Yanis who played the full 80 minutes and were strong in the scrum that didn’t budge all day. Our backrow of Eymael, Ham and Felix proved themselves as potentially the most effective in the competition with their workrate and impact on the breakdown. Tim Marsh created a great try for Luke Simmons and should have scored one himself if it wasn’t for a poor referees decision that robbed him of a spectacular 80m effort. Cal McDonald was strong as well. This week we play the vastly improved Singleton Bulls at home. The Bulls have built up well in the off season and again we are going to need to be on task if we are to take the points. I would encourage all supporters to get down to No 2 on Saturday afternoon and cheer the boys on. It promises to be a huge day of Rugby with the 19’s starting at 11am against the Gropers. Four big games and great entertainment for all our fans. The Player Points System continues to confuse and frustrate players, coaches and fans alike. There are a number of ideas doing the rounds that would see the PPS work better towards its goal, that is, to even up the competition. The best idea has been promoted by the Greens and one which we support, that is, that clubs are rewarded for producing juniors that move into First and Second Grade. Rather than just allocating them 0 points, the same as an import player that has been at the club for three years, why not give these players a deduction of minus 1 or minus 2 points. This would not only promote Juniors into the senior grades but would reward those clubs that resource and pay attention to Junior development. There are lots of ideas that are floating around, ideas that the NHRU should investigate to ensure equity for all clubs and that Clubs are producing realistic pathways for Junior players. On the same topic, the NHRU recently held an Open Forum that discussed the development of the game, how the Schools System were not invited to attend is certainly beyond me. The NHRU needs to recognise that Schools Rugby, for long the breeding ground for club Rugby is currently in crisis and unless something is done straight away the game is in danger of disappearing from our schools. Where then would the game be? Remember that four big games of Rugby will be played Saturday. see all of the Two Blues teams in action at the home of Rugby. It would be great to see everyone there! Welcome to another year of Wanderers Rugby. In 2017 the Rugby arm of the Club face a huge number of challenges in terms of realigning our policies and practices to ensure that we stay ’ahead of the game’ in regards to our prominent place in the landscape of Newcastle and Hunter Rugby. Already this year we have done a tremendous amount of work in ensuring that the pathway we have so long promised as a ‘one club’ is realised. Re-focusing our efforts with our Junior Academy and our WTS have both been tremendous successes. Our Wider Training Squad was dedicated to the ‘next generation’ of Wanderer and the players in the squad worked tirelessly over the summer to ensure they enter the 2017 season in tip top condition. The great work done by Bill Coffey and his team at Pinpoint, who must accept much of the kudos for this program, was innovative, on point and certainly all of our supporters will see the benefits of their work once our season starts. Our Academy embraced our strong and well managed Junior base and identified talented players in our U15, U16 and U17 squads who it was felt displayed the ability to go on to long and successful stints in the years to come with Wanderers Grade teams. A thorough program of skill development was coordinated by Trevor Hefren and a team of dedicated coaches including Cal McDonald, Warren Badger and Shane Goldthorpe. The engagement from the players was fantastic and the quality of the work is already showing benefits if the performance of the teams in the junior trials held so far is any indication. One of the main challenges we are facing surround the replacement of the quality players that have left us to go on to ‘greener pastures’. Andrew Tuala and Phil Bradford are at West Harbour, Dan Martine is at Warringah and Marcus Christensen is plying his trade at Parramatta. Having our programs recognised by these Shute Shield Clubs in regards to developing players is certainly a pat on the back for us all. Providing these opportunities however provides a void in ensuring we have quality replacements to fill their shoes. This recruitment strategy will become increasingly paramount for us moving forward. While our Junior Club continue to produce top quality players, many of which progress to the senior ranks, as a club we need to investigate new and innovative ways to make us a more attractive option for locally based players. Part of this strategy is ensuring that our resource base is as strong as it could be and my full congratulations to General Manager Cal McDonald for the passion and work ethic he has displayed in securing these resources. This is by far not a one man job however and any and all connections within the Wanderers family need to be on the lookout for these sorts of opportunities. The Club is blessed to have such dedicated men as Viv Passi and Darren Young heading up our two Premier Rugby teams. Their work is tireless and often goes unseen. Getting our teams on the field and playing as well as they do is hard work, and these two men are at the forefront of it. In 2017 we have further embraced the growth of Women’s rugby with a concerted effort to engage and grow our women’s program. You will see many of their matches played after our top Grade at No 2 this year so please hang around and cheer on another team pushing the boundaries for the growth of Wanderers Rugby. Our Juniors also continue to lead the way both on and off the field in terms of policy and procedure in ensuring that our Club provides a suitable atmosphere for the growth and development of juniors not only as players but also as young people. My full congratulations to Jon Nightingale and his committee for the tireless work they do and for the dedicated foresight they show in ensuring Wanderers Juniors are the benchmark club in this area. It would be remiss of me not to mention the disappointing resolution to an issue over Player points that we raised with the NHRU over the summer. Our intention was always to see equity across the board in the implementation of this policy. During season 2016 there were a number of clubs that were penalised for breaches of the Points System and we openly acknowledge that like us, they were honest mistakes and at no stage have we ever thought other clubs were trying to rort the system. To be accused of ‘bringing the game into disrepute’ was offensive to all at the Club, least of all the many, many volunteers that donate their time and effort to ensuring the health and subsistence of Club Rugby in Newcastle. I am sure I speak for many in the Rugby fraternity that only seek consistency in these types of decisions from the games governing body. We are all looking at Round 1 and the local derby against Merewether with great anticipation. Merewether have continued their strong recruitment over the past few years and when you mix it in with their strong junior base and the quality of their administration and coaching they will certainly be a huge hurdle for us to jump in Round 1. Many of the pundits are already writing us off as true title contenders being keen to talk about our flood of new faces and lack of depth. For many our ‘time in the sun’ is over. However I am confident, as are the players and coaches that season 2017 will hold great things for the two blues. This flood of new faces gives our P1 squad in particular a different dimension than that we have displayed in previous years. We have managed to secure a number of exciting prospects including Josh McCormack, Gus Locke and Cam Dombkins, and, when you mix them in with our established senior players such as Luke Simmons and Ben Ham then I think we will be happy to fly under the radar with the so called local experts. Our supporters can look forward to a new look and battle hardened Wanderers team and one, with just an ounce of luck, can go one better than last year. It will surely be tough with the likes of Hamilton, Merewether and Lake Macquarie providing a stern test. Some patience early as we put in place new people and new ways to play the game will surely pay benefits when we get to the end of the year. Best of luck to all teams in the 2017 season! Insights from various personalities from within the Wanderers.